So your question is, are antidepressants bad because they don’t work, or bad because they do? We can eliminate a few possibilities right off the bat. For starters, if I’m in the antidepressant business, I’m not about to sell a product that permanently cheers people up. What I want is something they need on a regular basis, like a nice glass of wine—an antidepressant that works on a lot of levels, including financially for the winemaker and therapeutically for everybody else. But I take it you’re more interested in pills. One in nine Americans over age 12 takes antidepressants, including one in four women between 40 and 59. Since the early 1990s antidepressant use has increased 400 percent across all age groups. Sure, there have been some bumps in the road over the past 20 years, but nobody’s going to tell me life has become 400 percent more depressing. One American in 12 takes antidepressants despite having no depressive symptoms whatsoever. Less than a third of those taking antidepressants have had a checkup with a mental-health professional in the past year, and one in seven has been on antidepressants for more than a decade. Nearly three quarters of all antidepressant prescriptions are written without any diagnosis of a psychiatric problem. Primary-care physicians are much more likely to prescribe these drugs than specialists—one in 11 visits to a primary-care physician results in a new prescription or refill. In nearly 80 percent of these office visits where there’s no psychiatric diagnosis, there’s also no specific psychiatric complaint from the patient. Summing up, it’s fair to say a common attitude in the medical community is basically take your Prozac and don’t come back. People are none too happy about this: nearly a quarter of respondents to a 2008 phone survey cited the chance they’d get put on unwanted meds as a reason they might not tell their doctor they felt depressed. A review of 177 studies involving more than 24,000 depressed patients found placebos alleviated symptoms in 38 percent, while antidepressants reduced them in 46 percent. Psychotherapy alone reduced symptoms in 47 percent, about the same as antidepressants but usually at higher cost. 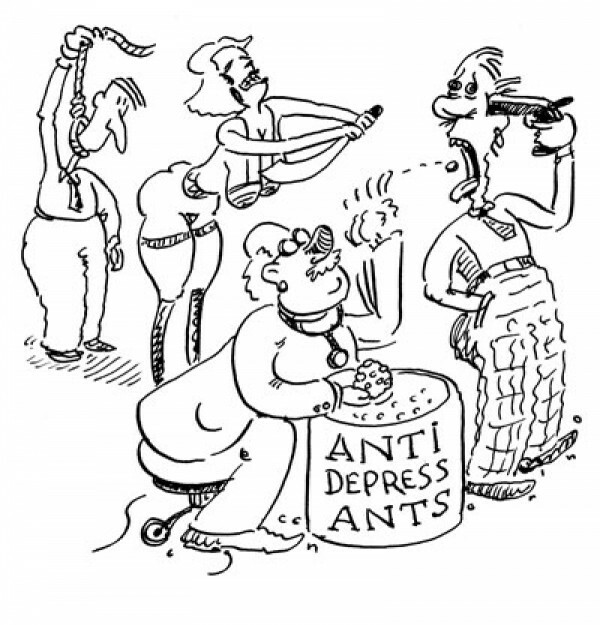 Best of all was combining antidepressants and psychotherapy, with a 52 percent success rate. A review of 96 studies published from 1980 to 2005 concluded the placebo effect was likely responsible for 68 percent of the improvement seen in patients taking antidepressants. Another review pegged it at 84 percent. What’s more, the placebo effect appears to be growing over time. Some research says there’s no medicinal benefit. A European study of “active placebos” (where the placebo mimicked the drug’s side effects) found no significant difference between placebos and antidepressants. The latter were just particularly persuasive fakes. So why are antidepressants prescribed so often? We find a clue in a review of 35 antidepressant clinical trials submitted to the FDA. (And bear in mind, the FDA sets a low bar—it requires that clinical trials show a significant difference between a drug and a placebo but doesn’t limit the number of trials, enabling drug manufacturers to keep rolling the dice until they get the desired result.) The review found that, on average, antidepressants didn’t meet the criteria for “clinical significance”—in other words, technically they didn’t do anything, except for one group: patients rated as extremely depressed. We further note that: 1. the U.S. population is aging, and elderly patients require more medical attention, among other things for depression; and 2. the percentage of primary-care physicians has dropped significantly. In 1950, about half of doctors were in primary care; now it’s barely over 30 percent. The upshot is that primary-care doctors have higher patient loads and less time to spend per patient. Since everyone nowadays expects the doctor to do something, and since antidepressants evidently work for the extremely depressed and make many others feel better, if only through the power of suggestion, the default response is to prescribe drugs for anyone with a mood beef—next patient, please. The situation is likely to get worse. The number of primary-care physicians entering the field between now and 2020 isn’t expected to keep up with demand. How all this will play out in the face of rising health-care costs and the Affordable Care Act remains to be seen, but for a lot of people, pills might be all they ever get.